The standard validation framework (JSR 303: Bean Validation) implemented in Java EE 6. Java EE 6 標準規範下 Bean 的驗證框架與實作. 在專案的業務屬性中, 你是不是要經常驗證屬性的取值範圍呢？想要瞭解比較優美的解決方案嗎？用 Annotations 給 class 或者 class 的屬性加上約束(constraint), 在 RT 運行期檢查屬性值是很優雅的. "JSR 303 defines a metadata model and API for JavaBean validation. The default metadata source is annotations, with the ability to override and extend the meta-data through the use of XML validation descriptors. The API is not tied to a specific application tier or programming model. It is specifically not tied to either the web tier or the persistence tier, and is available for both server-side application programming, as well as rich client Swing application developers." Hibernate Validator 4.x is the reference implementation for JSR 303 - Bean Validation. 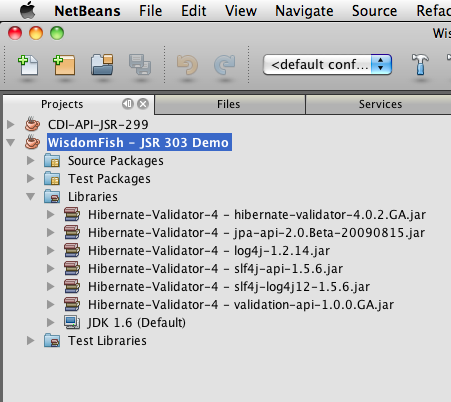 JSR 303 defines a metadata model and API for JavaBean validation. The default metadata source is annotations, with the ability to override and extend the meta-data through the use of XML validation descriptors. The API is not tied to a specific application tier or programming model. It is specifically not tied to either the web tier or the persistence tier, and is available for both server-side application programming, as well as rich client Swing application developer. The goal of the Bean Validation project is to deliver an implementation of the Bean Validation Specfication (JSR303), which is TCK compliant and works on Java SE 5 or later. The initial codebase for the project was donated to the ASF by a SGA from Agimatec GmbH and uses the ASL 2.0 license. @Min: The annotated element must be a number whose value must be higher or equal to the specified minimum. @Max: The annotated element must be a number whose value must be lower or equal to the specified maximum. @Size: The annotated element must be between specified minimum and maximum boundaries. @NotNull: The annotated element must not be null. @Null: The annotated element must be null. @Pattern: The annotated element must match the specified Java regular expression.